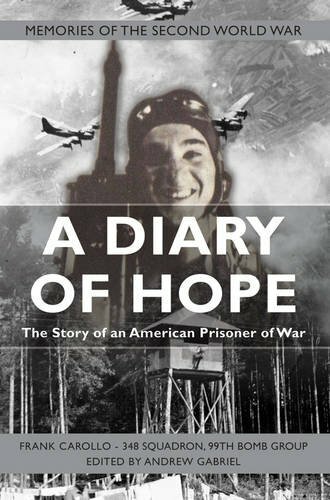 ‘A Diary of Hope’ tells the story of Frank Carollo, an American who joined the airforce in January 1942. From October of that year he saw active service as a radio operator, taking part in 48 missions until his plane, the `Flak Dodger’, was shot down over Austria on its 49th. After this brief introduction this short book really deals with Frank’s subsequent internment at the notorious Stalag XVIIB prisoner of war camp. Frank managed to keep a diary and scrap book, and much of the content is reproduced, supplemented with notes by Frank’s grandson. Sketches and poems by Frank and other POWs feature heavily, giving some indication of what life was like. Frank was liberated in May 1945 and returned home to his delighted family and girlfriend. Yet Frank’s war was not over. The spectre of Stalag XVIIB haunted him for the rest of his life, casting him into periods of deep depression. His family supported and comforted him, yet it was something that would affect him for the rest of his life, the deep-rooted trauma coming to the fore later due to the onset of Alzheimer’s. Frank’s grandson deals with this part of Frank’s life with dignity and sensitivity, recollecting Frank’s happier times and full of admiration for a man whose strong will and desire to see his loved ones again helped him through what must have been some horrific experiences.